Phase I Site Work is nearing completion on the site of our new maintenance facility. The site contours have been completed, so the future pattern of traffic through the site is visible now. There are also new curbs, gutters, and sidewalks on two sides of the property. Meanwhile underground utilities are almost all installed—sewer is the deepest, then water service pipes, storm water pipes, and finally the electrical. By the end of November, the site will have new asphalt, fencing, the remaining sidewalk, and some landscaping completed—all weather-permitting. 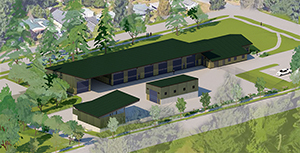 Back in early September, North City Water District submitted building plans for the new maintenance building, along with a wash structure and a decant facility. The decant facility permit is ready, however we were required to resubmit plans to the City in late October for the other two buildings. If all goes smoothly, we expect to put all three buildings out for construction bid in early December (weather permitting), award the contract, and begin construction in early 2019.